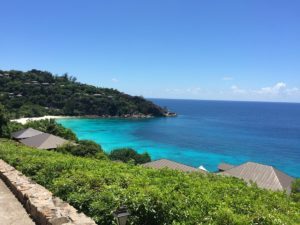 The main reason behind leaving Mauritius was the desire to explore new waters and coming to Seychelles proved to be the best choice. I reached Mahé during the night and could not enjoy the beauty of Seychelles yet. 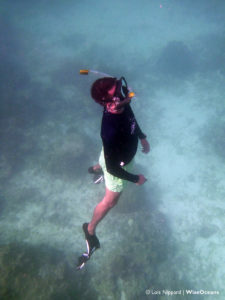 I was first welcomed by the amazing Ben Taylor (Education and Outreach Manager of WiseOceans Seychelles) and eventually to the rest of the team. My first day of work started with a superb sunrise at Petite Anse and a warm welcome by the Four Seasons Resort Seychelles employees. I think that all the people who walked down the hill to the beach will understand my feelings when I first saw this breath-taking piece of paradise. Sunny day, calm sea, sandy beach comparable to flour and all tones of blue, I could not ask for anything more. 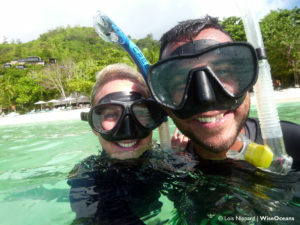 After being introduced to the various interesting projects here, we headed for my first a snorkelling session with Georgina and it was above my expectations. Bumphead parrotfish, batfish and angelfish were my first wonderful sightings. I was very pleased to shadow Lois Nippard during a snorkel before her transfer to Four Seasons Resort Mauritius at Anahita. We were lucky to see a whitetip reef shark, and this was my first encounter with this incredible animal. This Marine Educator post gives me the opportunity to meet new people every day, to learn from every conversation with guests. 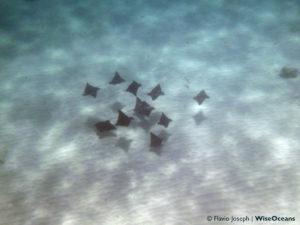 Educating people on the marine environment and its members make them aware of what exists down there. My favourite one is when they realise that a coral is an animal! 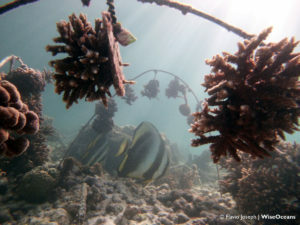 I have the opportunity of going to snorkel every day and enjoy the diverse underwater life here. It is fantastic to have such a space just next to you, where you can go every day and each time have a different experience. 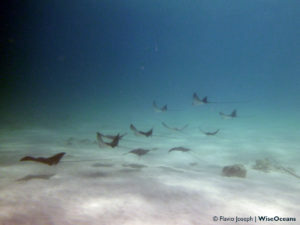 I will always remember when I came across a school of 11 spotted eagle rays at the end of one of my snorkels. I am sure that the upcoming months on my new island will be as amazing as the first one.